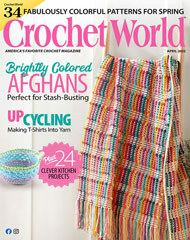 Refresh your kitchen decor with a bushel of mouth-watering designs created from worsted yarn. Size: Hot Pad: 6 1/2" x 7" not including hanging loop. Pot Holder: 3 1/4" x 7" not including hanging loop. Coaster: 4 1/4" x 5". Place Mat: 13" across.